France's new president is pushing Paris' bid for the 2024 Olympics on Tuesday and building a government with a fresh face — lean, half-female and tasked with carrying out Macron's plans to rethink labor laws and overhaul politics. In his second full day in office, Emmanuel Macron hosted a delegation from the International Olympic Committee in the Elysee Palace, a symbolically important gesture of support for the French capital's bid in its heated race against Los Angeles for the 2024 Games. Macron said he would go to Lausanne, Switzerland, for a key IOC meeting in July and to Lima, Peru, in September, where the committee makes its final decision, according to members of the Paris bid committee speaking to reporters at the Elysee afterward. Winning the games would be a big boost for France after years of economic stagnation and fading global influence — and a boost for Macron as the untested 39-year-old president embarks on his term. Macron's main task Tuesday, however, is forming a new a government after naming low-profile, center-right Edouard Philippe as prime minister Monday. It's a delicate balancing act, as Macron tries to redesign French politics by borrowing ministers from left and right and introducing new faces as well as experienced heavyweights who can help him make his mark on Europe and world affairs. On his first foreign trip after barely 24 hours in office, Macron met Monday with German Chancellor Angela Merkel in Berlin and pushed for more coordination among countries that use the euro. 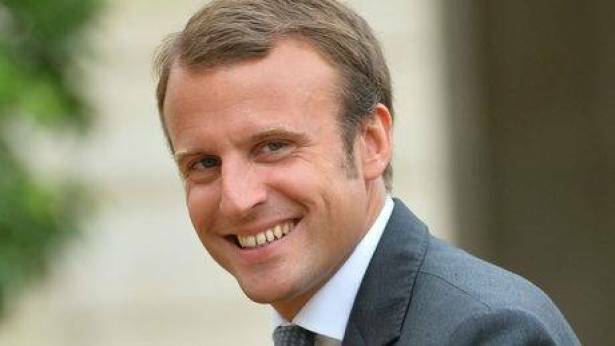 Back at home, criticism from Socialists and conservative Republicans met Macron's nomination of Philippe as prime minister. The traditional parties fear being sidelined by Macron's growing centrist party Republic on the Move in crucial parliamentary elections next month. Macron "wants to create a majority by exploding the right as he exploded the left," senior Republicans lawmaker Bernard Accoyer told the France-2 TV station. And far-right leader Marine Le Pen, runner-up in the May 7 presidential runoff, said Macron and Philippe represent "the sacred alliance of the old right and left, united in their wish to remain in place at any price." Their new government is expected to be half women, half men, and about half the size of former President Francois Hollande's Cabinet. It will hold its first meeting Wednesday. However it may only serve for a few weeks. If Macron's party doesn't win a majority in parliamentary elections June 11 and 18, then he might have to form a coalition or have a government led by an opposition party.